I spent the spring and summer of 1973 working at IBM and living with my parents in the western New York factory town they had moved to a year before. I had just gotten a VW van and while I was there, I offered to take each of them camping to the place of their choice. My father chose the Jersey shore. My mother wanted to tour Gettysburg, so that’s where she and I went. My mother was born in Richmond and remembered seeing old gray-bearded veterans rocking on porches in nursing homes when she was a girl. Her Uncle Bob was an avid Civil War historian and inspired the same passion in her, which she in turn passed on to me. I think she first took me to see Gone With the Wind when I was six. On a summer visit to Richmond, Uncle Bob toured us around local battlefields and bought me a minnie ball. He had a civil war musket over his fireplace and gave my mother a first edition of General Sherman’s Memoirs. It was natural then, for us to set out for Gettysburg, but it turned out to be far more than either of us expected. Growing up on the east coast, I had visited other battlefields, but Gettysburg is about something more than history. Everyone I have ever met who who has been there has the same thing to say: Gettysburg is sacred ground. These are the exact words people use. First of all, the battlefield is incredibly beautiful. In early June, 1973 everything was in bloom. At the Devil’s Den, my mother said it looked like a team of Japanese gardeners had been working the land for a hundred years. There was a distinct oriental feel to the granite boulders, the blooming dogwood, and the surrounding fields of wildflowers. 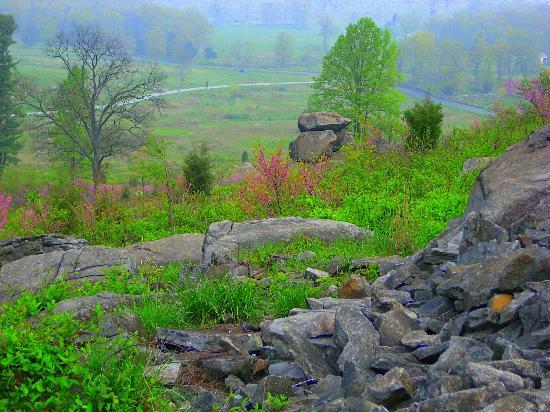 But our nation is filled with natural wonders, and the feeling at Gettysburg is not about beauty alone. It is like the feeling of peace you sometimes experience in old cemeteries, especially the old ones on the east coast, with statues of sad angels silently keeping watch. At the start of July, 1863, 150,000 men fought on this ground. In the next three days, they suffered 50,000 casualties; one out of every three men was killed, wounded, or captured. In a place of so much horror, you would expect a negative vibe, but Gettysburg is the opposite. In some places, you lower your voice, as if you were standing in church. Lincoln got it right in his address: in some inexplicable way, the blood of so many young men forever hallowed this ground. I think of Gettysburg and often watch the movie again at this time of the year. Gettysburg was released in 1993 and was based on the best historical novel I’ve ever read, The Killer Angels, 1974 by Michael Shaara. The book won a Pulitzer prize, and I believe it is still required reading in military academies. Over the next few days, I am going to post about what happened there. This was the turning point of the war. At moments, the outcome depended on just a few men who did the right or the wrong thing under fire. Some of these stories are better than fiction. The soldiers of both armies showed incredible courage, but the south had dominated the battlefields for the first two years of the war. They had brilliant generals, while the north put the wrong men in leadership roles at precisely the wrong times. By the summer of 1863, Lee was convinced that a victory on northern soil would finish the north’s already flagging will to fight. It was just at this pivotal moment that Lee’s own judgement and that of some of his key commanders failed. At the same time, several Union field commanders made precisely the right moves, and all these actions combined to tip the outcome. Part of Lee’s problem was beyond anyone’s control – he had lost Stonewall Jackson, the general he called his “right arm,” at the battle of Chancellorsville in May. The new commanders of the Stonewall brigade did not have Jackson’s uncanny instinct for always doing the right thing. What was avoidable was the serious lapse in judgement of Lee’s cavalry commander, J.E.B. Stuart. Cavalry was the eyes and ears of the army, but Stuart had gone “joyriding,” as some of the other commanders put it – tearing through Pennsylvania, trying to sow confusion and panic in the population. He succeeded, but left Lee without knowledge of the Union army’s location and strength. On July 29, 1863, Lee’s army was stretched over miles of Pennsylvania roads, vulnerable to attack. Late that night, an actor-turned-spy named Harrison reported to Generals Longstreet and Lee that elements of a stronger Union force were no more than four hours away. Lee send word to all his commanders to assemble at a sleepy little town called Gettysburg where all the highways happened to meet. This entry was posted in Book Reviews, History, Movies, Travel and tagged book reviews, Civil War, history, movies, travel. Bookmark the permalink. My husband and I have been wanting to visit Gettysburg since moving to Virginia several years ago, but haven’t made it there yet. Thanks for writing about it so passionately.